This semester, students in Professor Andrew Rippeon’s “Unpacking My Library: The Book, The Burke, and the 20th Century” (Literature & Creative Writing) are introduced to the history and practice of the book in a long arc from the pre-Gutenberg era into the present. With a focus on the 20th century, Rippeon’s students consider “the book” and “the library” as literary, theoretical, and material engagements: what does it mean to curate a library? How do technological developments bear upon information? How do authors and artists respond to these questions? 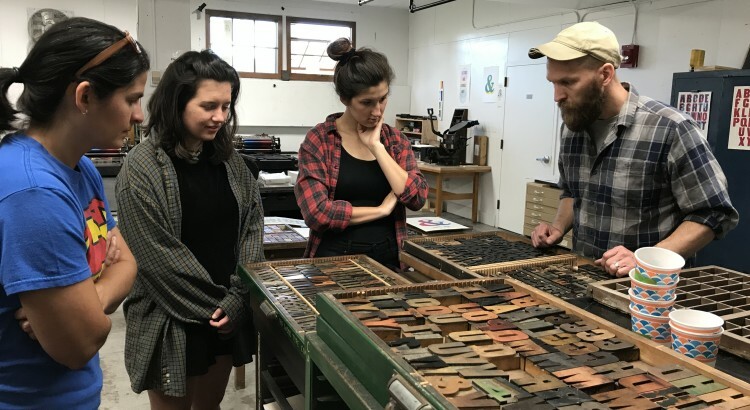 Over the semester, and in addition to reading in these contexts and to writing their own original critical essays, students make letterpressed broadsides and books, curate micro-libraries, and produce (as a hard-copy book) an anthology of their writing. 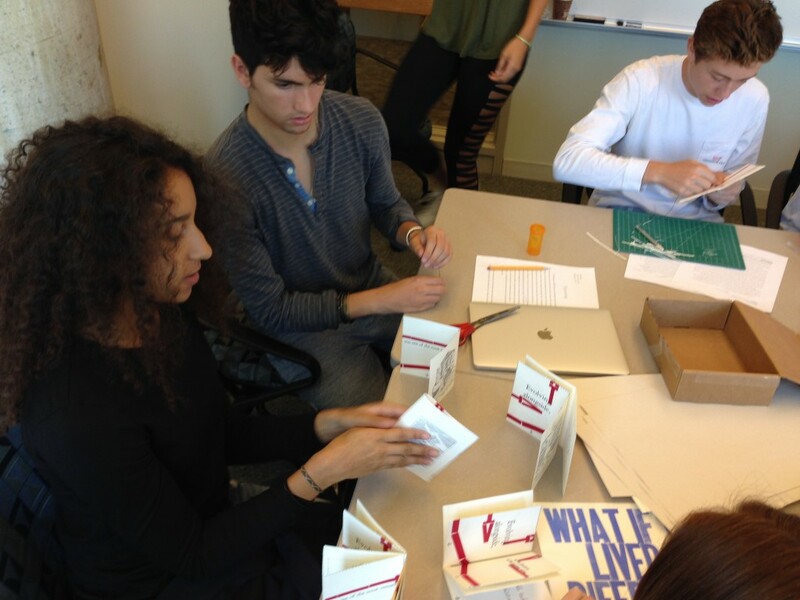 Above: Students put the finishing touches on a book making project. Top: Prof. Andrew Rippeon demonstrates setting type to a group of students. In this iteration of the course, students will create their own charged technological context for the book: how does an augmented-reality book further pressurize the context we’re discussing? Students will use 3D technologies (3D printing and the Sprout Pro learning station), and augmented reality applications to produce a book that has a much broader material-technological footprint, at once engaging with and commenting upon the status of the book in the 21st century. We intend to produce an augmented-reality book that documents its own context and production. Continuing their engagement with “the book” in a technologically mediated environment (at once threatening and enabling), with the assistance of partners in Digital Humanities, Computer Science, and Research & Instructional Design, students will develop and build an Augmented Reality “Book of Sand.” Inspired by the Borges story of the same title and the Argentinian artist Mariano Sardón’s treatment of that text, students in the class will construct a physical sand-table, and with the assistance of senior Computer Science thesis groups, participate in coding a digital library for “use” on the sand-table. The end-goal is to produce a digital-material interface for the purposes of provoking interactions with (rather than passive reception of) individual texts, genetic iterations of a single text, and larger digital libraries. Read more about the revival of letterpress printing at Hamilton.